I despise the cold and hate the season of snow and dead looking trees. Grey skies and a body not tolerant of bundling up in layers combines to make the fact that we’re at the beginning of what is officially winter now gives me no reason to celebrate. In my mind I’m like a “winter warrior” that endures through the tough season…wearing my own made garments to make staying warm much more enjoyable than it could be. 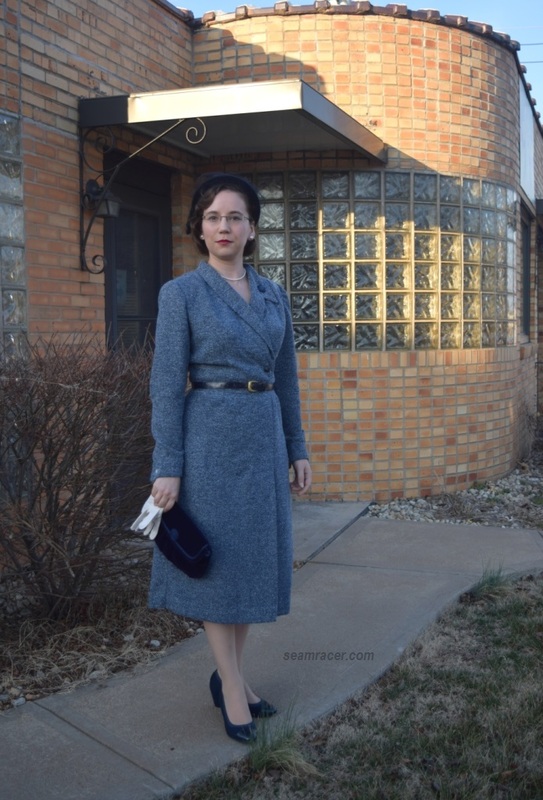 This post’s suit dress is from 1955 and to me is the best of me putting up with the past cold season in lovely vintage style. I love this! Warm (but not bulky) boucle, slimming design, interesting asymmetric features, and mid-50’s chic fashion. 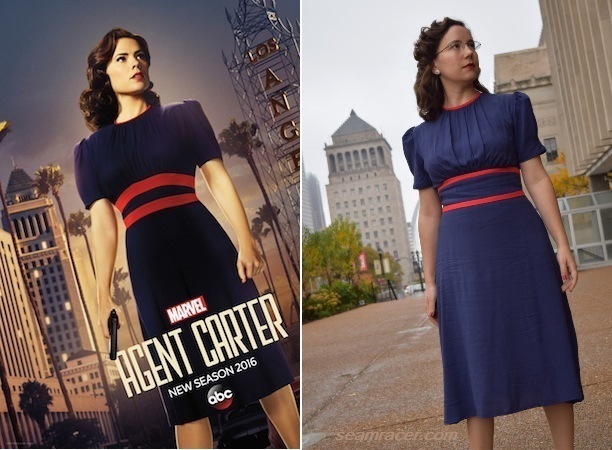 There’s even a good influence of Agent Carter inspiration, courtesy of Peggy’s Smithsonian interview from the movie “Captain America: Winter Soldier”, to combine for one awesome result, if I do say so myself. (Watch the whole 3 minute clip here…warning, it’ll make you cry!) 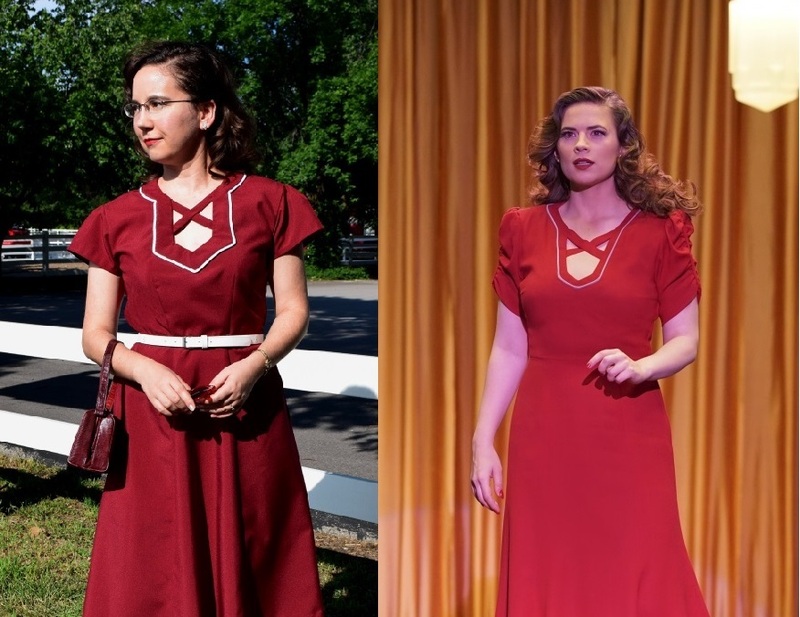 My dress may not be as “line for line” a copy as some of my other Agent Carter makes, but it is definitely similar in a way that is clearly recognizable, even if I do only have one lapel! Life is better with a little bit o’ Peggy in it! 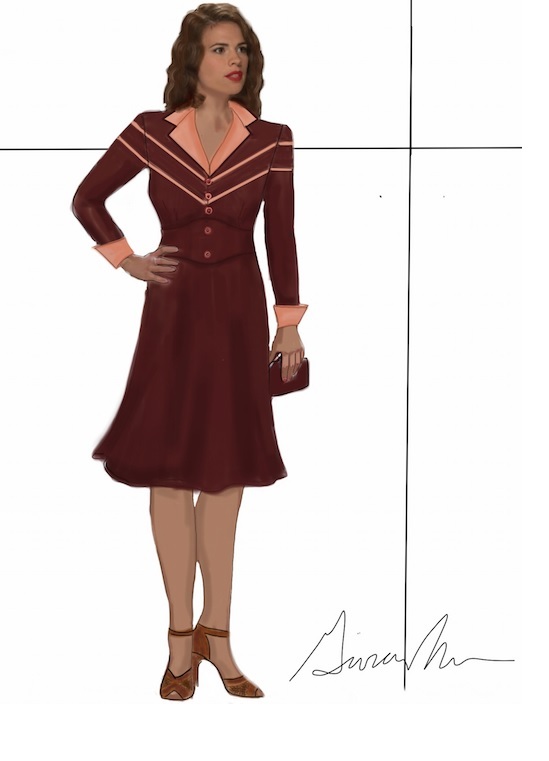 A good Agent Carter dress in 50’s era class deserved an amp up in some quality features. 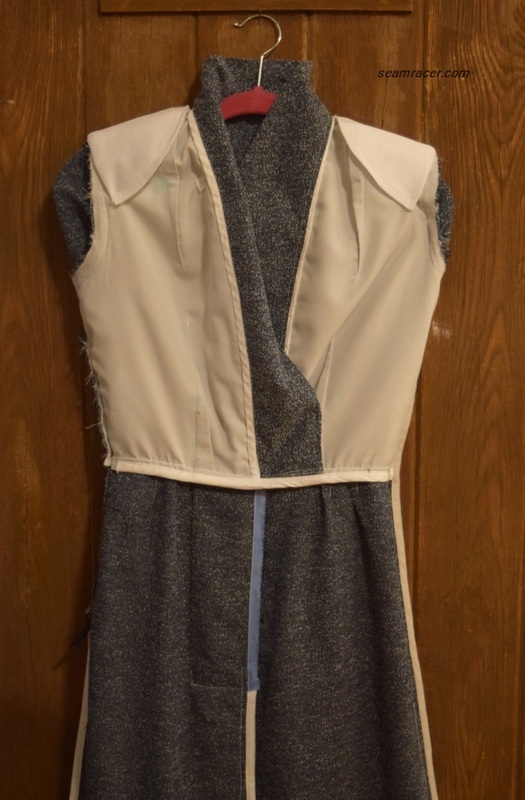 Perhaps that’s why this dress is the first to have me hand-stitch everything when it came to finishing – the side zipper, all top-stitching, and all hemming. As one who hates hand work due to achy wrists and a bad neck, this is a truly strong statement to how I feel about this (not just a slight brag) that my “Winter Soldier” dress is the first to have deserved such treatment. It deserved it, believe me, but all that hand stitching taught me some unexpected but much appreciated lessons on a new outlook to certain aspects of sewing. More about this down later! 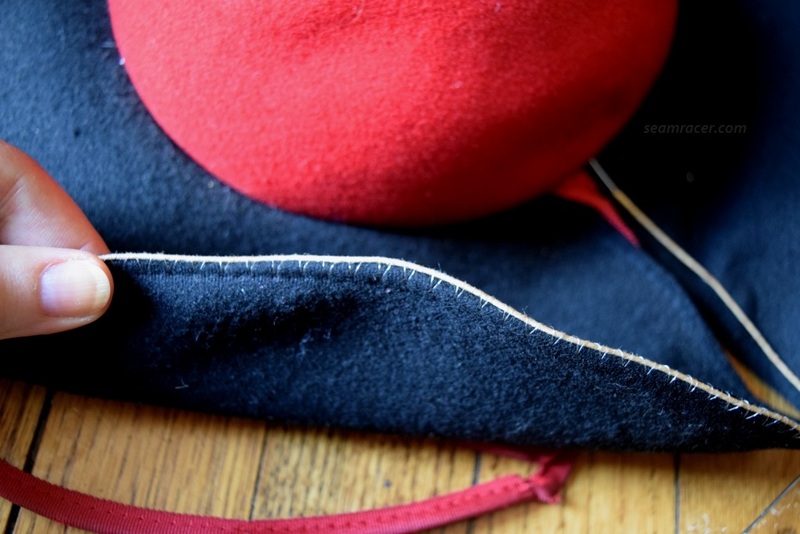 To “top off” my set is one of my favorite vintage hats that I own – a rich navy velvet halo hat, also asymmetric in style, complete with a matching velvet vintage clutch purse. My gloves are also vintage, so I guess my suede, patent toed heels are the only real modern accessories of my outfit! 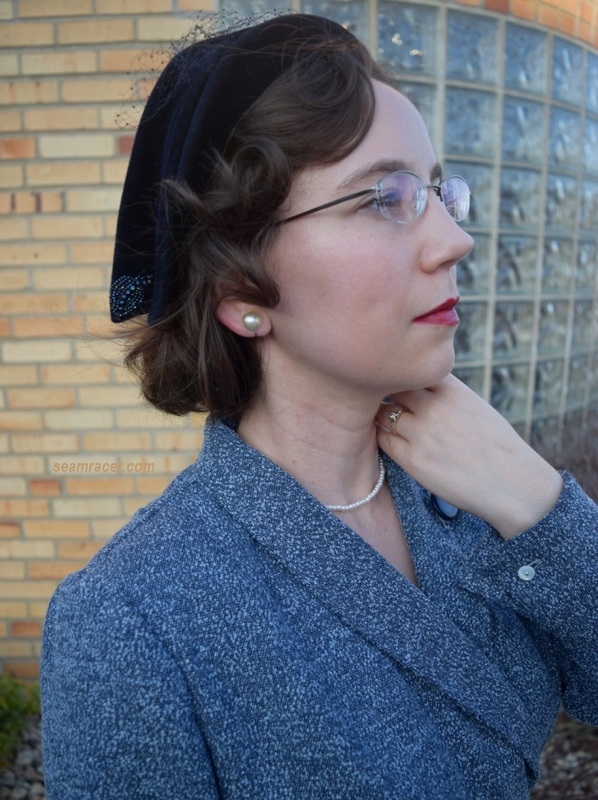 This kind of asymmetric halo hat found great popularity for a short period of time (about 1948 to 1953), so my hat is a tad early for the actual date of my pattern (1955). However, as the “Smithsonian Interview” scene was supposed to be in 1953, it is right on spot in both year and complimentary style, I do believe. 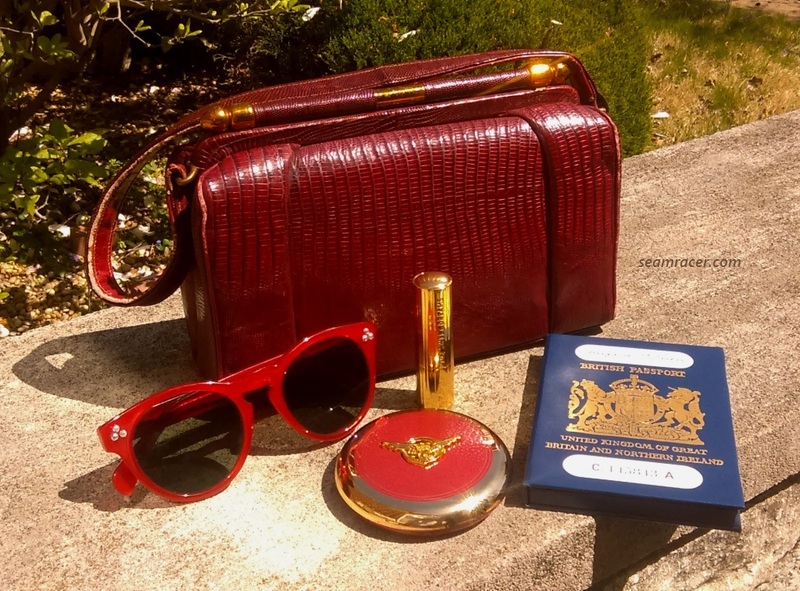 My lipstick is my favorite crimson shade, “Red Velvet” from Besame Cosmetics. “Red Velvet” goes on so smooth and is intense in pigment. 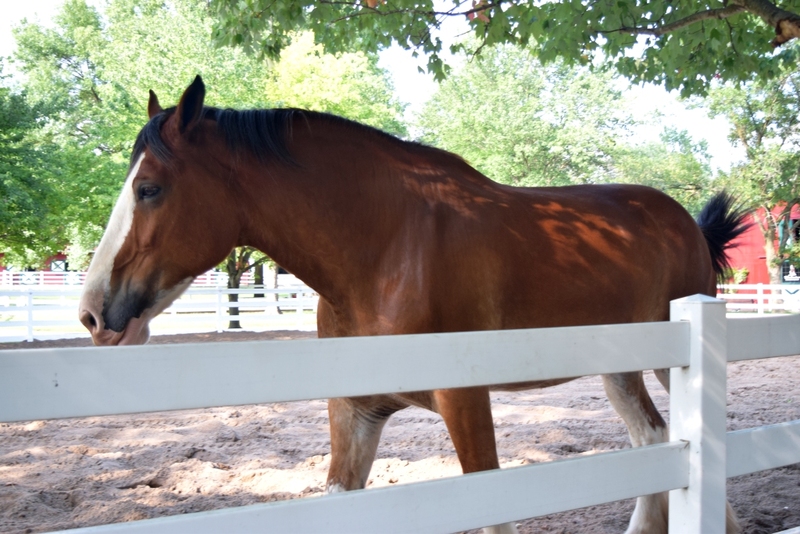 It often lasts through eating a meal! Anyway, I’m naturally swayed in favor of “Red Velvet” – it’s the color that the Agent Carter actress Hayley Atwell wears whenever she’s in character, so it is only fitting to pair it with this Captain America outfit. 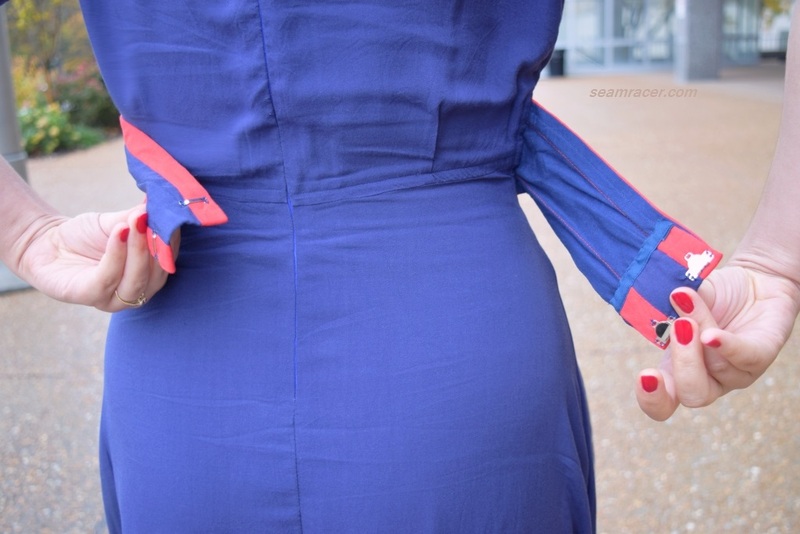 I love how subtly patriotic and richly cheery it makes my mellow winter blue suit dress! NOTIONS: I had all the interfacing, thread, and other notions needed (bias tapes, shoulder pads, zipper) in my stash already. Yay for using what’s on hand for a project that easily comes together! The buttons are vintage from my Grandmother’s collection. TIME TO COMPLETE: This was finished on February 11, 2017, and took me about 20 or more hours to make. THE INSIDES: All cleanly bias bound, as boucle shreds like a maniac otherwise! TOTAL COST: The boucle had been in my stash for I don’t even remember how long. It was one of those good materials that I hold onto until I find a very convincing reason to use it! My lining was something from my longtime stash, as well, so I’m actually counting this as free! 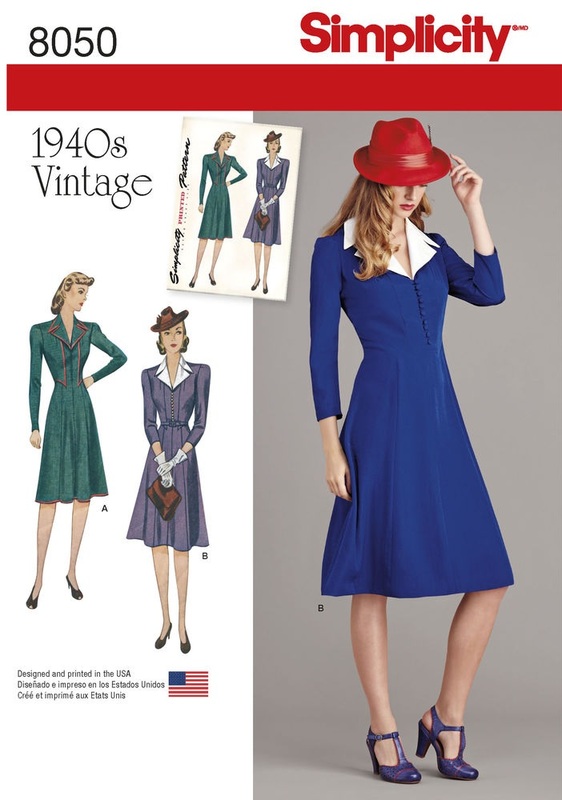 I’ve never gone wrong knocking-off or copying a Peggy Carter outfit for myself, and this dress only continues the good trend, even though it is from the next decade than we’ve traditionally seen her in. 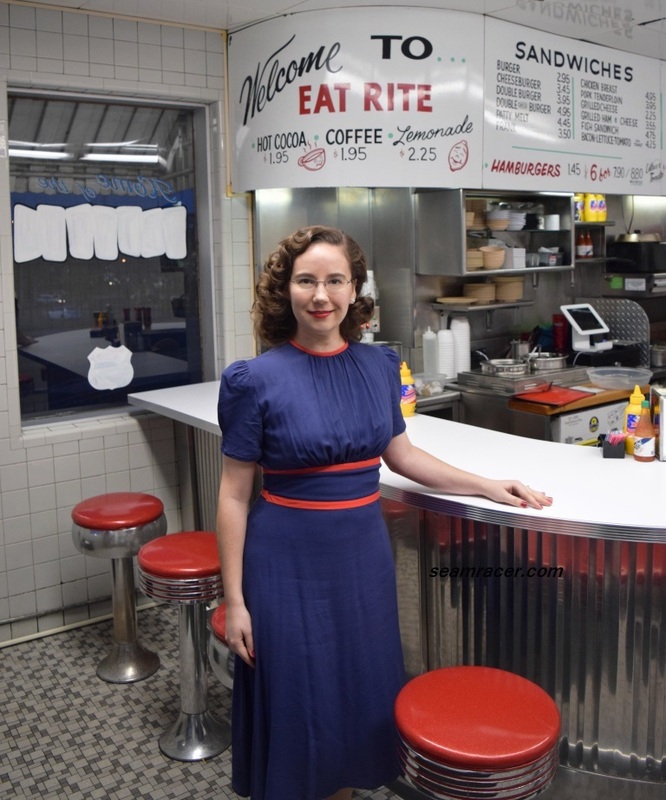 It is definitely 50’s, but it still has the strong shoulders with waist and hip slimming features that looked so well on her in the 40’s. In classic Peggy style, my dress is a wonderful combo of appearing impeccably put-together in a garment which is comfortable and practical. This is a soft, not stiff or even itchy, suit dress in just the right weight to keep me warm yet without being overly toasty indoors. 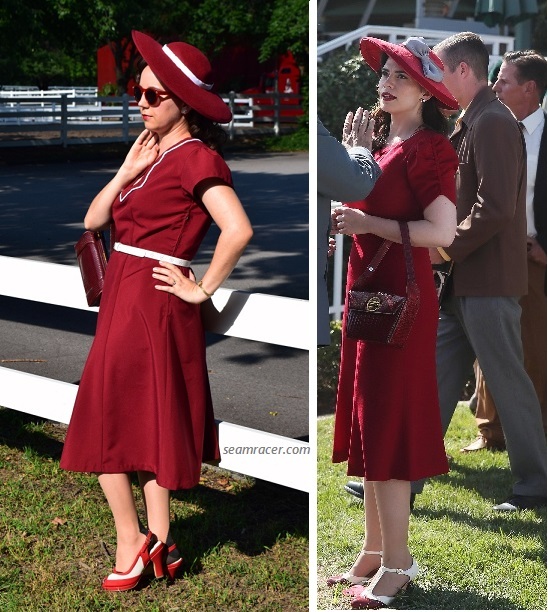 I have no idea if such an ideal dress exists in RTW (I am highly skeptical there is), so I am extremely thankful to be able to put my sewing capabilities to use to make my own “copy” of a garment worn by my fashion muse, Agent Peggy Carter. Sewing this dress was a real pleasure. 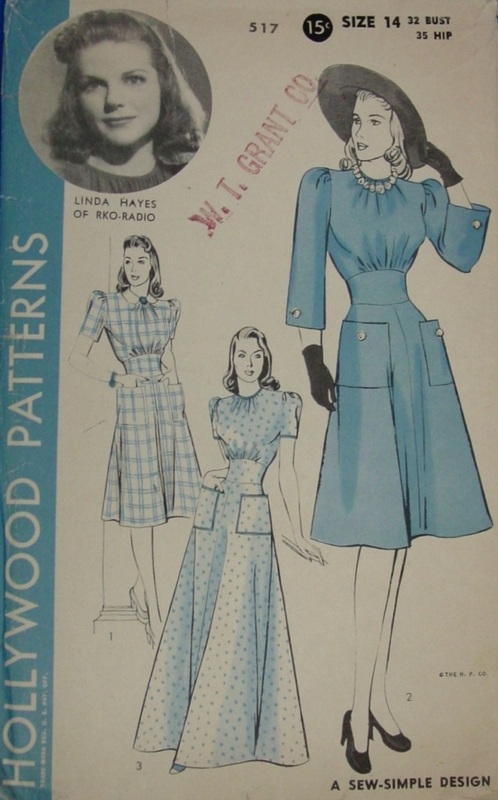 Sure it had its challenges, especially when it came to getting sharp corners to the collar and adding in the skirt pleats. The boucle was lofty and nubby making it hard to be so precise with such details. As tempting as it was to just pin it all down in place and whiz through to tack it down with a machine stitch, I couldn’t stand the thought of a harsh stitching line around the edges standing out against the lovely speckled boucle. I wanted a finish that would blend in with the boucle invisibly and there was only one way to do it. 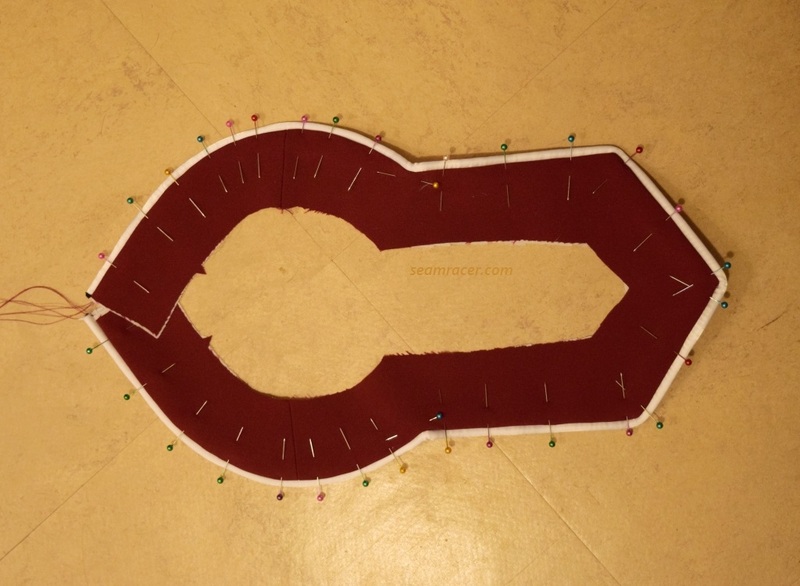 Many times I feel an inner unwilling tolerance to the necessity of doing a large amount of hand stitching, most due to my resulting physical discomfort. This time, I slowed down and took time to give it the detailed work it deserved, coming to a new realization of the power of time lavished and well-spent on a special quality which sets handmade clothes apart in best of ways from RTW. When a certain hand-made technique would make a particular garment be finished with a quality which would bring it to another level, a handmade garment can receive that treatment whereas a RTW dress made in a sweatshop or factory setting will not…ever. Bureaucratic time restraints and the frequently penny pinched fast fashion system has too many limitations on the quality of what can be offered in stores. A home dressmaker’s common constraints are often finding “free time” and availability of easily found or affordable supplies! As efficient and productive as I am with what I make, I do not like to see what quality I want be sacrificed to time constraints…especially not after this dress. What I found is that when I relaxed and appreciated my hand sewing like never before, it was not as uncomfortable to my body or as terribly drug out as I had expected. It’s amazing what a new outlook can do. I really do believe that quality concerns must be one of the many reasons I sew. I just hadn’t seen this before I had this dress to give me an example and come face-to-face with it. Poor quality is one main reasons why store bought clothes so quickly end up thrown or given away, and become uninteresting. 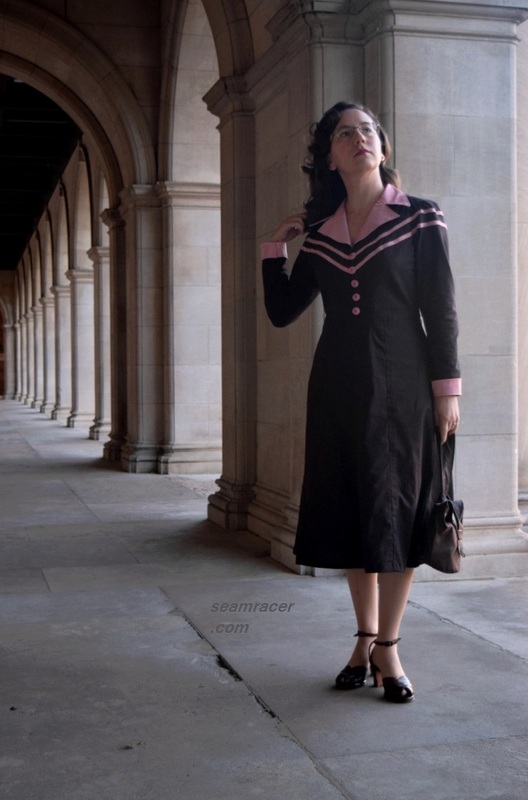 High quality is one of the main reasons why a vintage garment from 50, 70, or more years ago is still existing in such good condition and are such a treasured treat to wear. I want to learn from time-honored lessons. 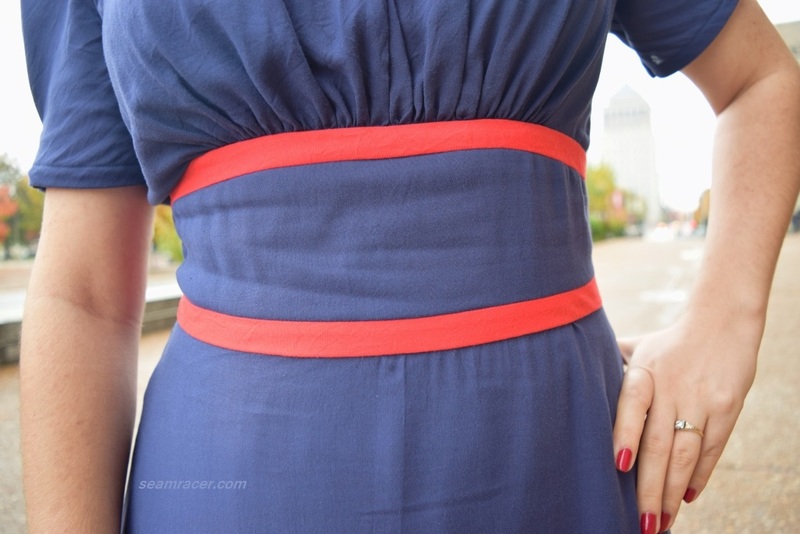 Be warned, though – a French seam or a hand-picked zipper and hems can totally “spoil” you in a very worthwhile way! Speaking of details, other than the aforementioned challenges with the points and corners arising from the nature of the fabric, the rest of my challenges were mainly about fit and the asymmetric front. You see, asymmetric designs are always an interesting departure from the “norm” because suddenly you don’t have one pattern piece which is laid on a double layer of fabric for an easy, instant result of both right and left sides. 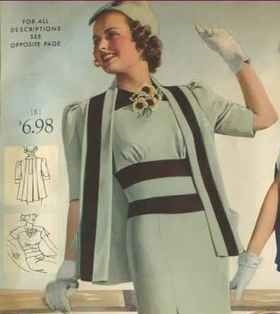 Ever since this 1947 asymmetric dress, I realized the importance of making sure your patterns are all equally facing “right side up” when laying them down on the single layer of fabric, otherwise you don’t end up with a “left” and a “right” piece with the good side of the fabric on the outside. When you are cutting double fabric layers with one piece you don’t have to think of this detail. Also, the fit was a bit unexpected on this pattern. The bodice turned out generous, but the skirt turned out slightly small. Bringing the seam allowances out and then in at the proper areas helped this matter but even still, this was a weirdly unique fitting fluke for a 50’s pattern. Oh well, this gave me an opportunity to use some thick 80’s style shoulder pads from my stash so as to fill in the extra fabric to the bodice, pick it up, and square it off. You’d never have guessed such big shoulder pads were in there, right? 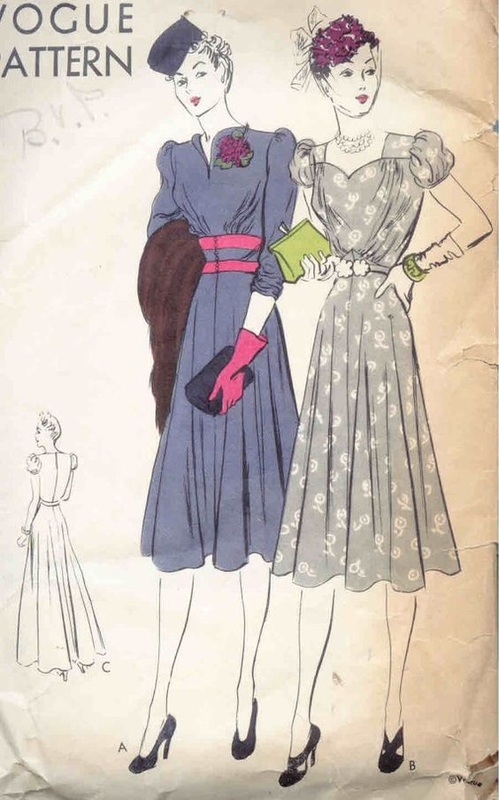 I’m always amazed at how vintage fashions benefit so discreetly from exaggerated shaping! Shape definition is something this decade of the 50’s was known for being good at – creating and emphasizing the ‘ideal’ hourglass shape. From the back the dress merely looks like a lovely, tailored, but basic dress. 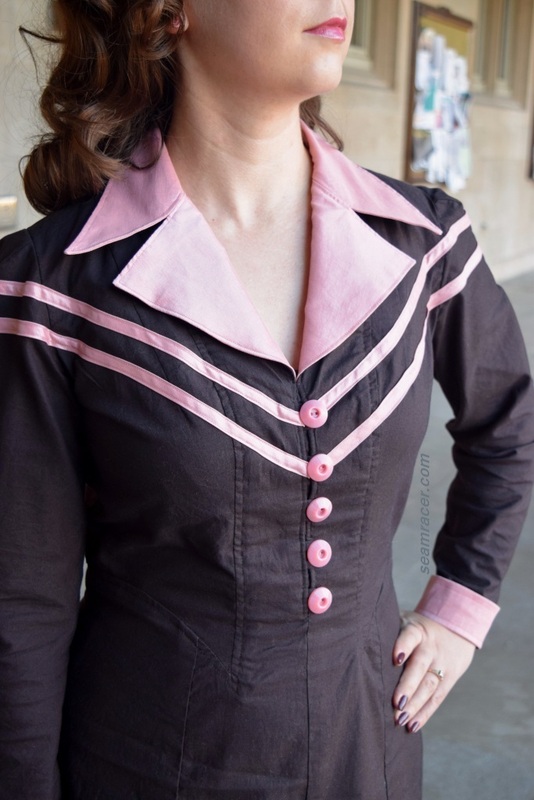 The sleeves quietly amp up the details – they have darted French cuffs (similar to these on this 30’s blouse I’ve made), cut on-one with the sleeves and merely faced. Now it’s the front that carries the weight of the intricacies! It might look like a wrap, but that’s only part of the guise. The “wrap” is sewn down from the waist to mid-thigh were the skirt releases up into a double pleated opening for fashionable freedom of movement. 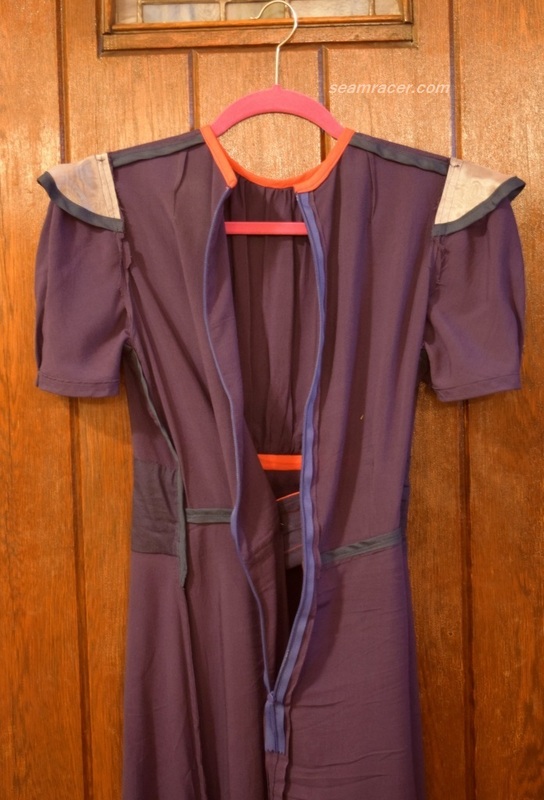 The pattern only called for a solo oversized button to ‘hold down’ the collar’s left lapel, but as I had a matching smaller sized button I added it above the waist to help keep the bodice wrap closed a little better and add to the asymmetric appearance. I will definitely be trying out pulling a small scarf through the collar lapel buttonhole, just like the cover envelope shows, for a whole different visual effect! My background is meant to lend a professional and city living kind of air to my outfit besides being rather accurate in era. However, for clarification, my background building is special…just about the last of its kind in the area, an icon in the history of the famous Route 66. It is an early 50’s office space, a late successor in the style of the infamous Coral Courts Motel, which had been just a block up the street. Glass block windows and golden bricks with decorative aluminum work began in the 1940 and 1950s as a way to build the bridge between late Art Deco and early Mid-Century architectural styles. The end of this post brings me to think of a quote from Sir Ranulph Fiennes, “There is no such thing as bad weather, only inappropriate clothing.” I see he’s described by The Guinness Book of Records as ‘the world’s greatest living explorer’ so his quote may not be the best from a fashion point of view, but technically it’s still every bit as appropriate. From my point of view, I really don’t see how, if you can sew or knit, why your clothes can’t be every bit as warm AND as fashionable as you would like! Beat that you cheap store bought dresses that only make me freeze in the winter…or you worthless sweaters that have unravelled on me after a few washes. 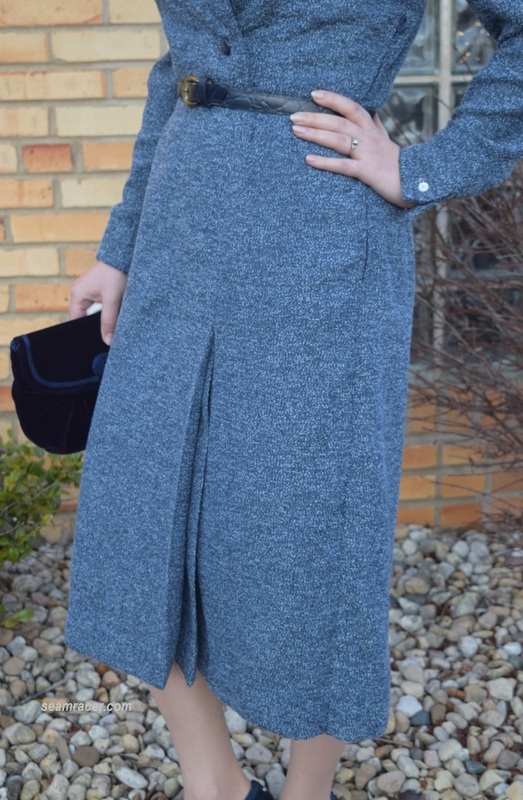 What is your favorite winter garment to make or favorite winter fabric to use? Do you like the dressy luxuriousness of velvet, the loftiness of fleece, cozy comfort of a knit, or the warmth of a classic wool? Do any of you find yourself infatuated with boucle as I am? If you haven’t experienced this fabric for yourself, you need to! Let me know your special way of rocking your winter style! 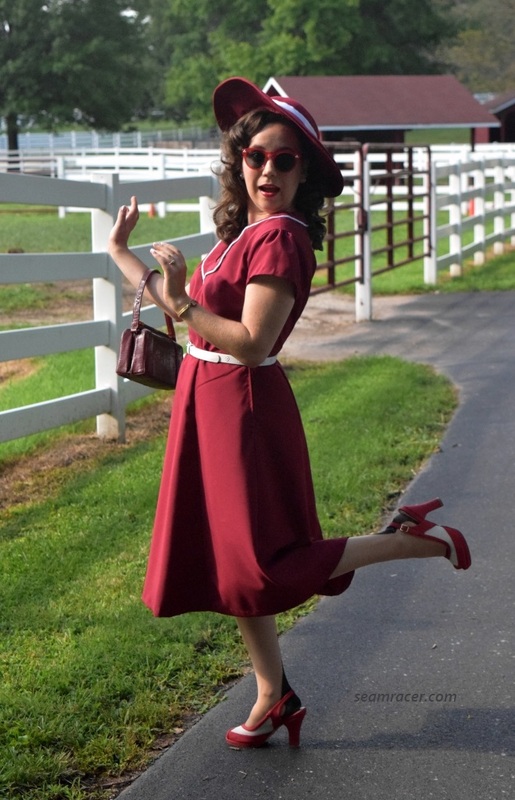 On a day that revolves around fear and frights, I can’t help but default to America’s Sweetheart, Peggy Carter, for the self-assurance to have a heroine’s heart! She was speaking to her nemesis, a woman who almost wiped out all of New York, when Peggy uttered my title’s quote, a perfect mantra for Halloween night. 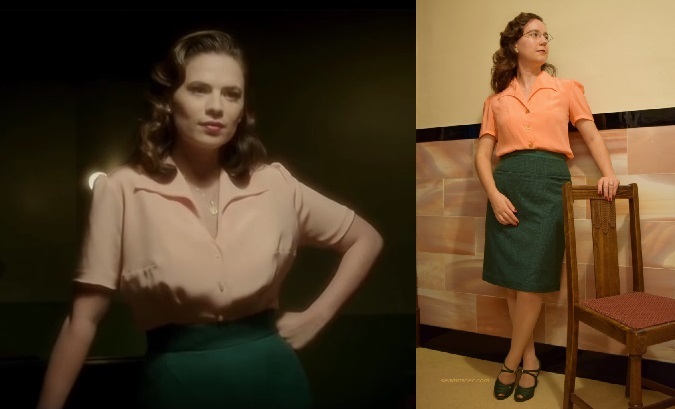 In those same first five minutes of the Second Season, you can see Agent Carter in a striking suit of the unusual combination of peach blouse and forest green skirt and jacket (see part of that here). I have interpreted this set into my own wardrobe, and as it has all the colors associated with Halloween, I’ll think of this outfit as a fashionable pumpkin! There wasn’t a whole lot of sewing needed for me to have this set. 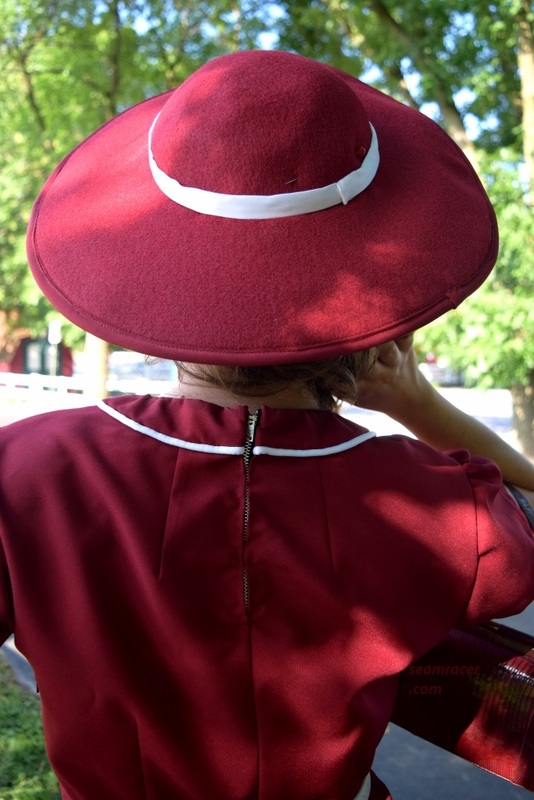 I sewed the blouse, and it is a luxurious everyday basic piece, in a cheery color, which I needed in my wardrobe anyway. The skirt is something I’ve had in my closet for the past decade, a RTW piece which had been not seeing much wear as of late, so it was time for a simple re-fashion to perk it up. My optional suit jacket is a true vintage piece that had been given to me by a friend, and fits like it was made for me. 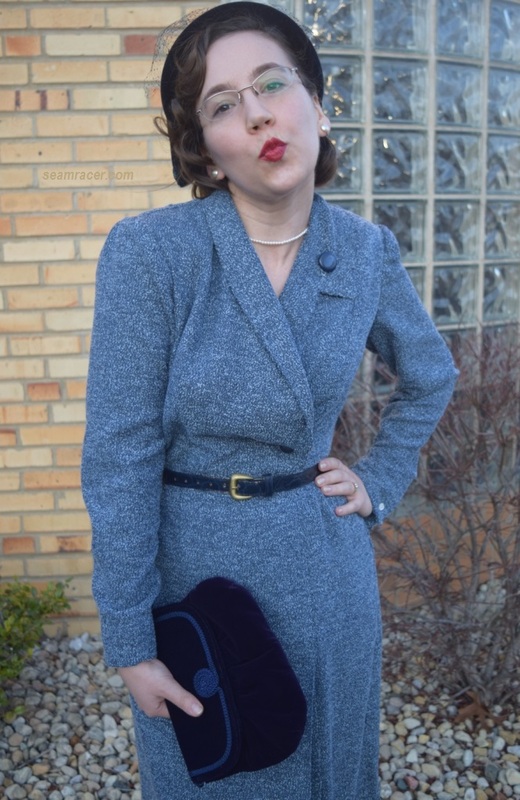 It was that simple – my easiest Agent Carter outfit yet! Perhaps the style choices of myself and Peggy are naturally on the same page – maybe that’s why I feel the need to have every one of her outfits in my closet as well, he he. Many of her wardrobe choices have a sensible practicality combined with a panache for a touch of standout details. 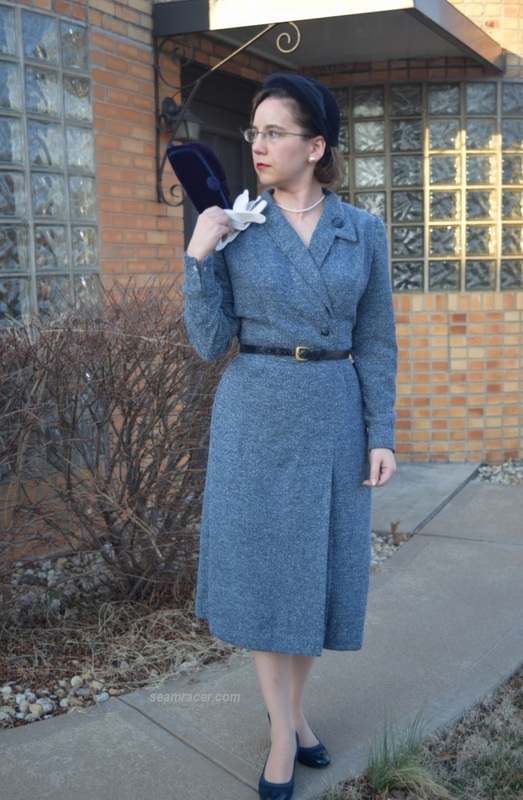 Perhaps there is something in your closet, too, that can translate easily into an Agent Carter outfit of your choice?! 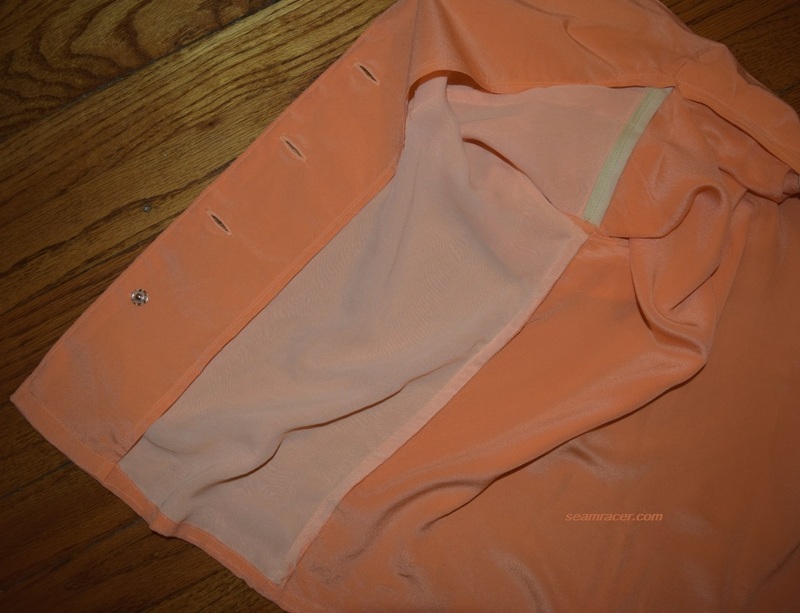 FABRIC: The fabric for my blouse is a 100% silk crepe de chine, from “Printed Silk Fabric” on Etsy, with the front lined in a peach poly chiffon from Jo Ann’s Fabric store. The skirt’s added portions are of a cotton twill suiting, also from Jo Ann’s. NOTIONS: I had the thread needed on hand already, as well as the abalone shell buttons I used, a snap, and a hook-and-eye. TIME TO COMPLETE: My silk blouse was cut and finished in 5 hours, on October 29, 2017. The skirt was refashioned in a few hours the day after Halloween. THE INSIDES: A nice blouse deserved nice finishing, the way I figured! The inside is in French seams. TOTAL COST: $20 for the blouse and a few more dollars for the extra fabrics from Jo Ann’s. How much more reasonable could an outfit like this get?! The blouse pattern I used is wonderful. It sews up in a flash and has a decently good fit (with a few tweaks) and lovely details. This silk version is actually the second time I have used it, so I was confident enough about the fit and details to slightly change it up a bit. 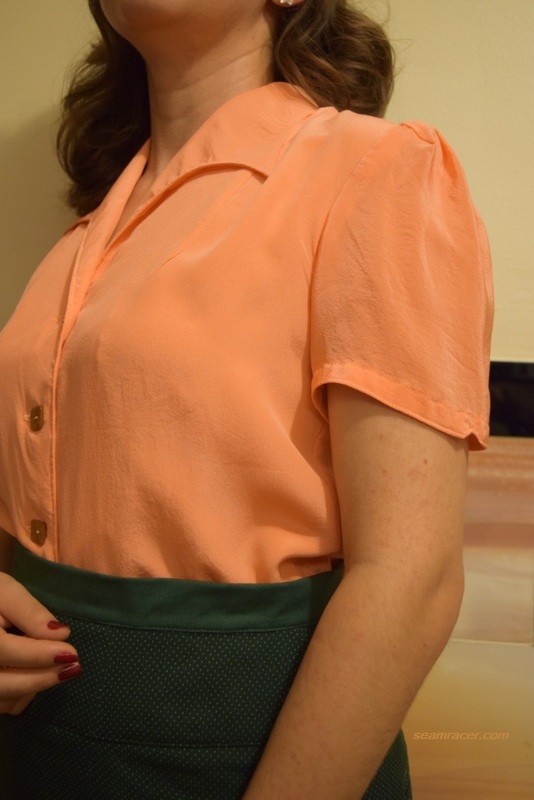 My first blouse version using this Simplicity re-issue was part of another Agent Carter themed outfit, and I will be posting that soon so you can get the full low-down on making the blouse as-is out of the envelope. For now, my second version will come first on my blog! My tweaks to the blouse pattern of Simplicity #8243 were small. First, I took out the downward curve that the collar points have and straightened them out so it could be more like my inspiration Agent Carter blouse. Her blouse had collar points which are more wing-like, more horizontal, pointing straight out towards her shoulders rather than down to the hips as on the original pattern. In other words, my current collar is now a true “wing collar”, much like the 1950s “Agent Sousa” shirt I already made for my husband! Secondly, I made the shoulders about 5/8 inch longer. The first time I made this pattern, the sleeves ended up more on my shoulder than going over it. This time I corrected the short shoulder line. Third, I changed up the sleeves to make them more like an early or mid-1940’s style than post war, as the original pattern is from 1948. I added pleats in between the trio of darts that shape the sleeve cap, creating more fullness as well as a bit more room for me to move. The original as-is length of the short sleeves is very long – not so that they can be ¾ length but so that you can have room to cuff the hem, as the original pattern shows. For this blouse, I cut off the excess length from the sleeve hems to have a facing-like binding strip to easily finish off the hem. 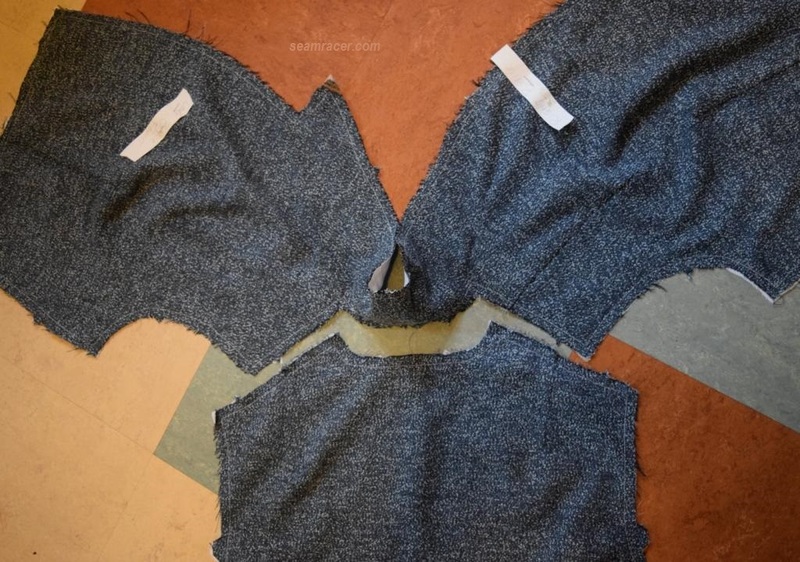 I added small triangular notches at the outer center hems of the sleeves. I love how this little detail adds just enough subtle class without detracting in complexity from the straightforward simplicity of the styling. 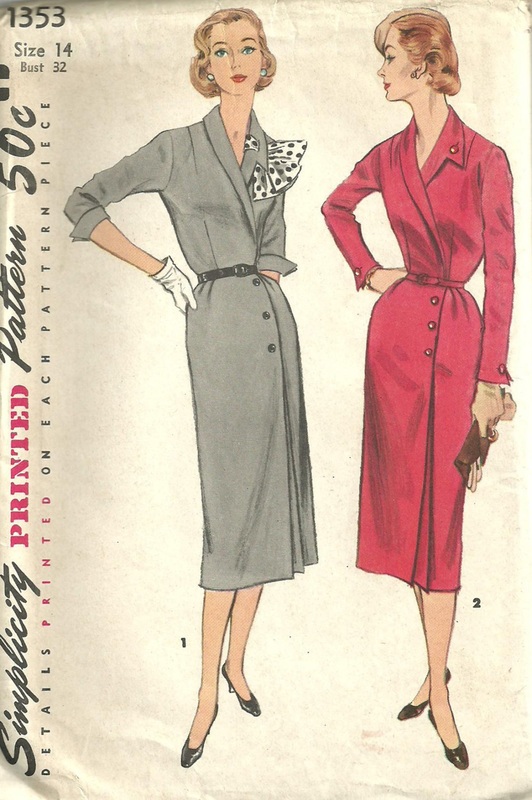 After all, there is a wide shoulder-to-bust dart that smoothly and beautifully shapes the blouse without the “traditional” gathers on so many other 40’s blouses. 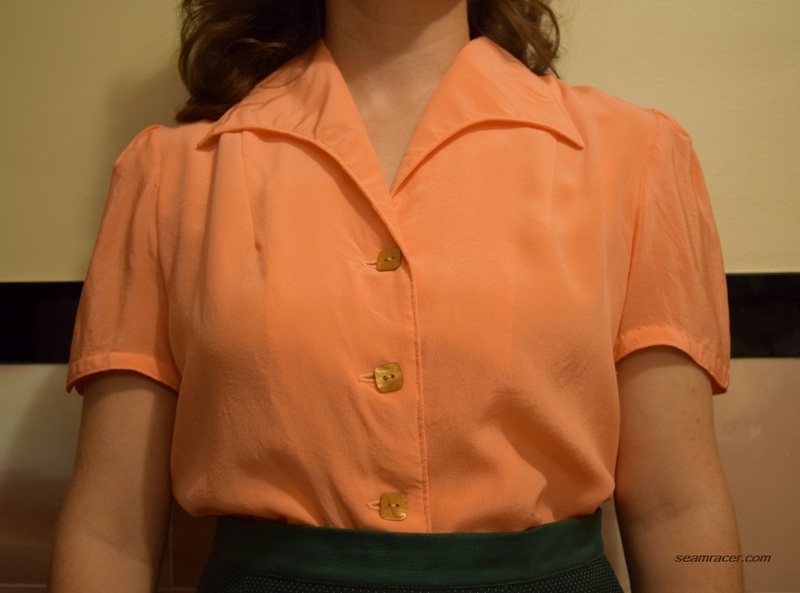 On this blouse, there are none of the common 40’s hem-to-waist shaping darts, as well, eliminating the conventional “blousy pouf” and making this blouse just as nice to wear untucked as tucked. I must say, that my main gripe about the pattern is the weird placement of the buttons if you follow the pattern’s markings. The bottom button is right at the waistline (does it end up as a lump under my waistband or what?) and the top one makes the neckline restrictively high, almost to the point of chocking. 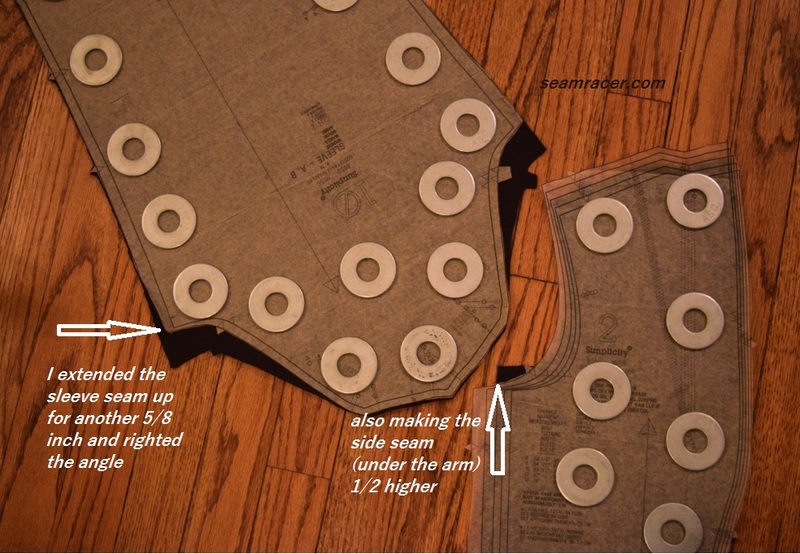 If you make this pattern, you need to change to your own liking where you put the buttons and button holes. I lowered my top button placement down 1 ½ inches and raised the lowest one 1 inch, with the middle one naturally in between. Three inches down from the last third button, I sewed on a snap to keep the lower half of the blouse closed. 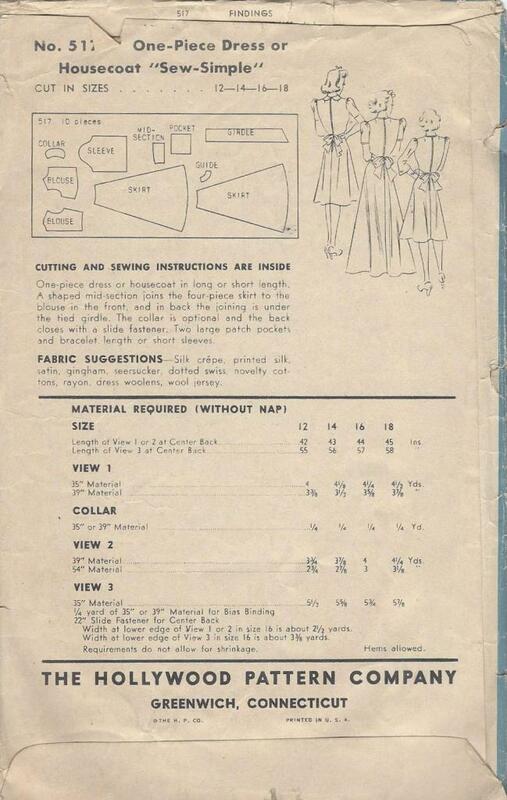 Sewing a snap below the waistline is something I see on many 1940s original patterns and it makes total sense. 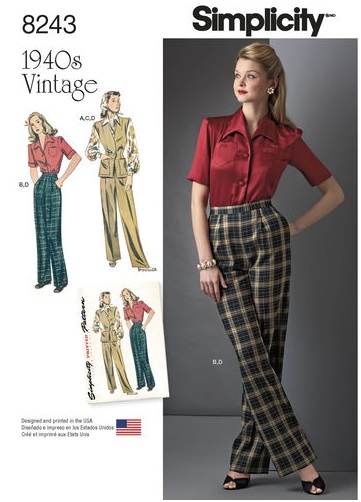 A snap would not show a bulge through the belly of a skirt or trousers like a button would, and I makes the bottom half of the blouse smooth if I want to wear it untucked. I wonder why this bit of sensibility which I always see in vintage patterns is somewhat lacking when it comes to the instructed closure of this blouse. The main body of the blouse seems to run a bit snug for me, so I cut a size bigger for the back than the front, and taper a size up for the hips. As my silk crepe de chine is a bit sheer, I doubled up on the back bodice, but as I only had two yards of 45 inch wide material, I used the supplementary fabric to line the front. 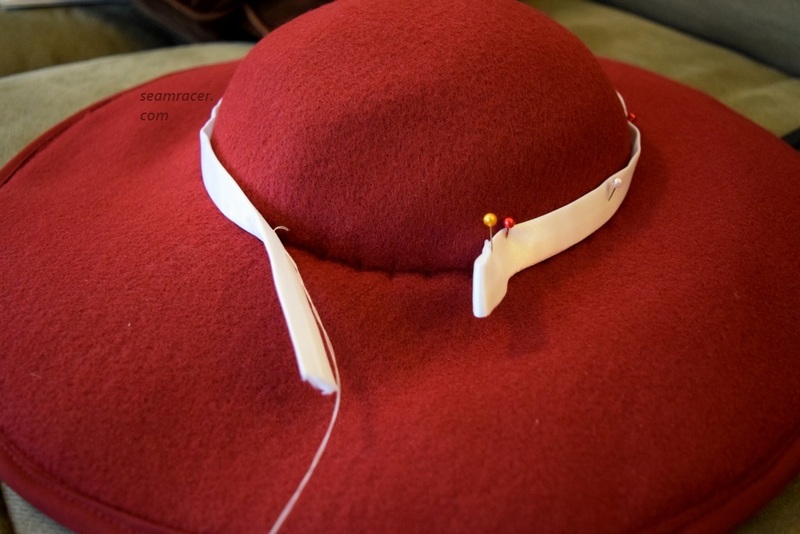 The all-in-one collar and front facing combo can be a bit fussy and not want to lay down well, but between ironing and some small tacking stitches between the layers, I am able to have my collar behave well! For my skirt, I really didn’t do anything to change the fit – I just added a few things to mostly change where it fit! The main addition was to give my skirt a true waistband. This was a skirt meant to sit on hips, with a wide waistband which ends just below the waist. 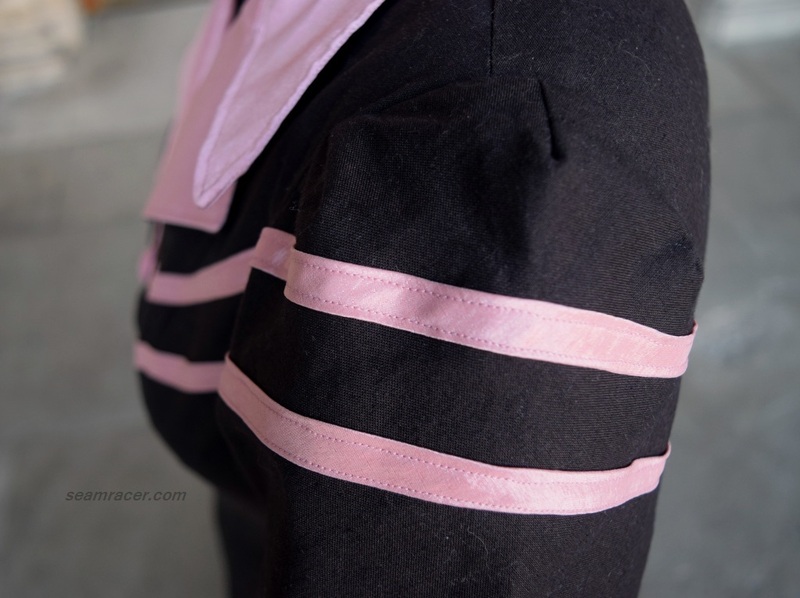 My waistband was sewn ¼ inch onto the edge, so it makes no real impact to the original skirt, ends just above the invisible back zipper, and I can easily take it off if I ever want to in the future. The back of the skirt had a high kick pleat-style slit for freedom of movement. I am not used to showing this much thigh, even if the slit doesn’t open up unless I do some true Agent Carter kick-but moves! 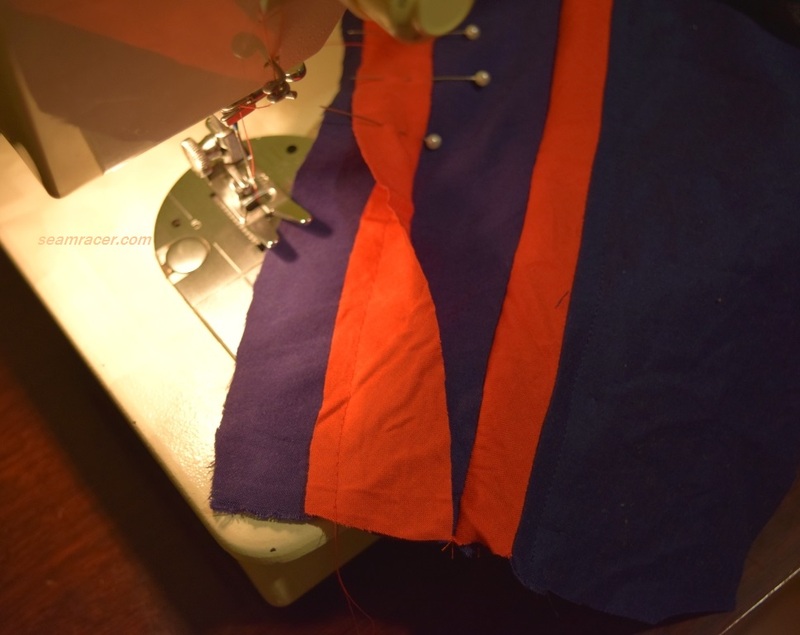 Nevertheless, I unpicked both the fashion fabric and the lining around the back opening to stitch it down like a slit. Then, I filled in the slit with a small rectangle of fabric I had left over from the waistband to make a box-pleated fill-in piece. This way the slit closes nicely on its own, but when it opens up as I need it, the fill-in piece unfolds to keep my thighs covered without restricting movement. My slit addition makes the skirt now look closer to a pattern from my stash – a McCall #6338 from 1945. Somehow, it seems as if there is always some small ‘something’ I would like to have which is lacking when it comes to RTW off the rack clothes. 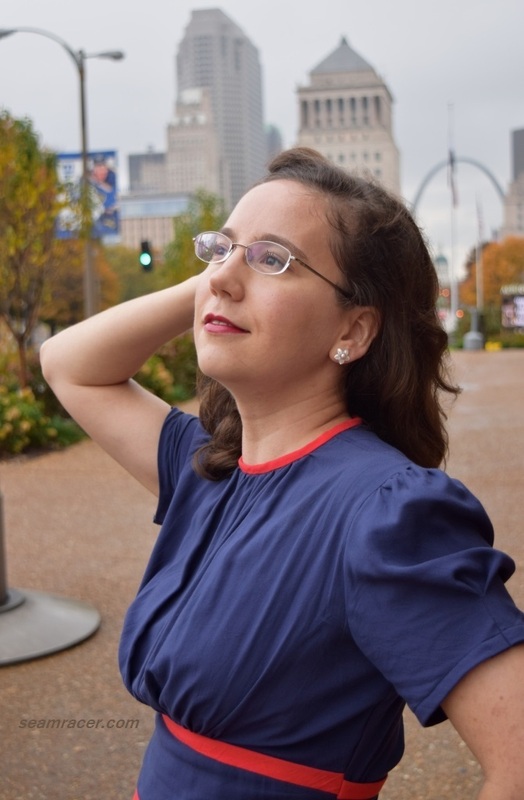 Whether it’s a detail (such as “…if only the neckline was different”), or the fit (who hasn’t had “…it fits except for here!”), or even availability (why is it so hard to find nice, solid colored blouses or non-knit bottoms? ), relying on off-the-rack can be so frustrating. 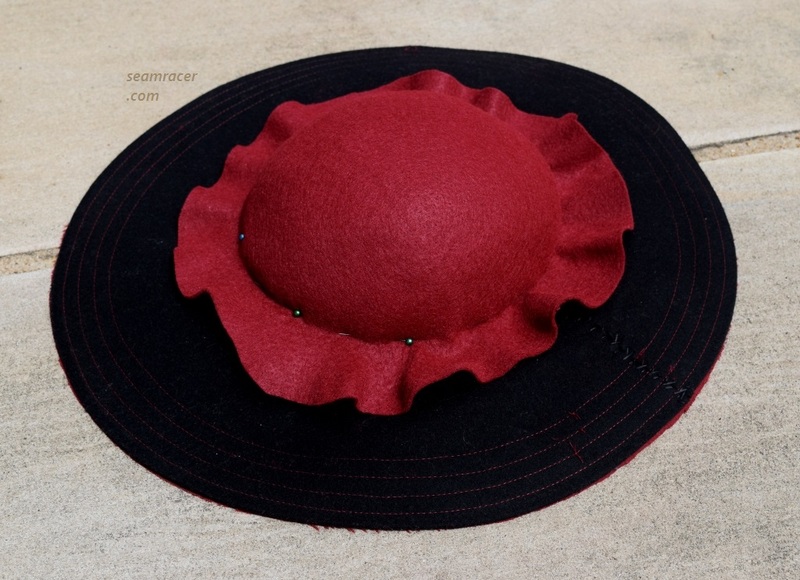 If you don’t have the time for sewing every dream item (who really does?! ), combining sewing skills with RTW can be a match made in heaven for making your clothes truly speak for you! Although this is a sort of an after-Halloween post, and an outfit from a “fantasy” character, this is not a costume. To me, this is something I am bringing into my own persona from a screen heroine that I can closely associate myself with. 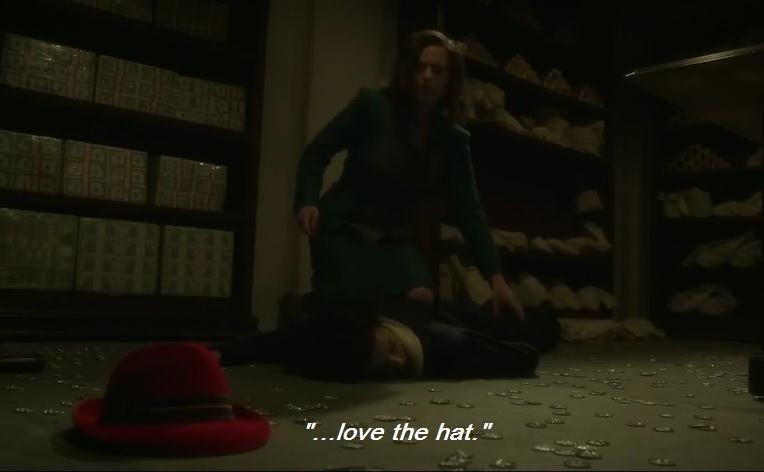 That is one of the many amazing things about Agent Carter. What she wears on screen can easily be worn by anyone today, yet is still very 1940’s chic, and not in the least a costume. I really do think that is one of the major attractions of Agent Carter – she’s so very realistic yet still as capable as any superhero, and she’s oh-so-empowering. That’s not even taking into account the fact that she started a whole new interest renewal in the fashions of the 1940’s…yay! I so want to see more of her story on screen…until then I’ll keep making her wardrobe for myself! 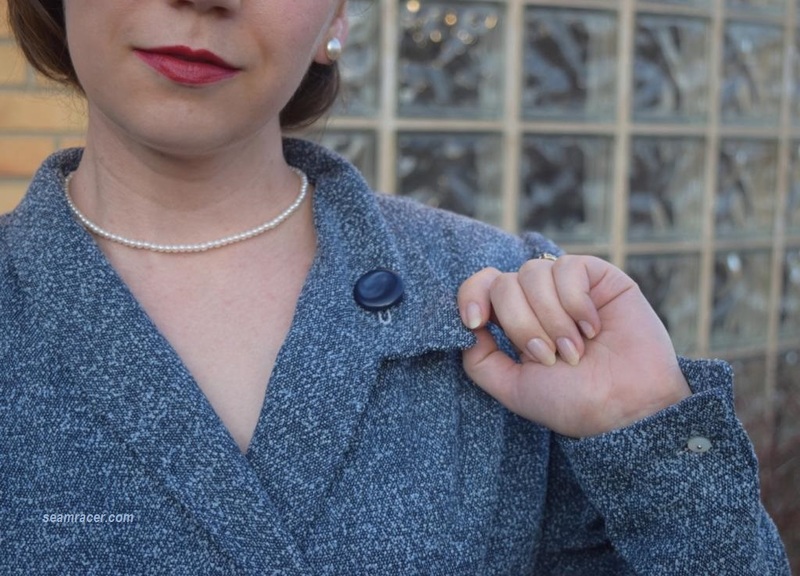 Right now, there’s a petition out there to “Save Agent Carter”, and it’s in need of more people to sign and join in the plea for Marvel to continue Peggy Carter’s story in some form or fashion. I’ve already signed up…will you consider signing, too? Let’s let Hollywood know the world is better with the inspiration and bravery of Agent Carter. Spread #SaveAgentCarter!